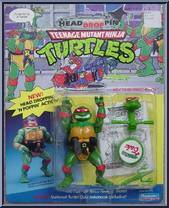 The POP-UP dock 'n dodge dude! VITAL POPTISTICS: Accessories: Trash Can Head Shield, Sewerpipe Periscope and Centipede Club! When the Foot start flyin', Don's head starts dodgin'. Protected by hi. . . The POP-UP limber-necked leader! 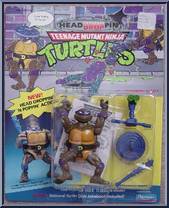 VITAL POPTISTICS: Accessories: Sewer Cover Casp, Garbage Can Scope and Bullfrog Slingshot! Being in charge means sticking your neck out - way out. And that's exac. . . The POP-UP party reptile! 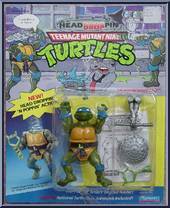 VITAL POPTISTICS: Accessories: Pizza Box Party Lid, Wacky-eyed Scope and Plunger Nunchuku! This dude's not comin' out of his shell - he's goin' in! He's Headdroppin' Mik. . . 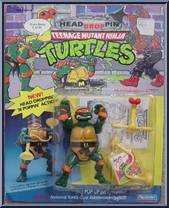 The POP-UP head hedgin' hero! VITAL POPTISTICS: Accessories: Soda Pop Top, Sewer Spy Scope and Scorpion Sai! 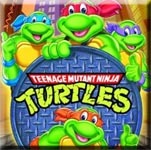 Raph's the Turtle-necked teen teaser. He doesn't go down for cover until the very last. . .